Always check my Lightfoot store to see what I have in stock. 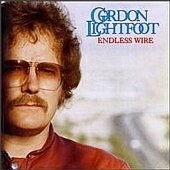 Released in 1978, Endless Wire was Lightfoot's first album following Summertime Dream. Endless Wire featured several signature songs, while not getting the acclaim it deserved. Highlights include "Daylight Katy", a minor hit in the UK, "If Children Had Wings", a poignant song written when his ex- wife moved to Europe with his children, and a re-recording of "The Circle Is Small", which first appeared on Back Here on Earth.